Community Tax is an accredited and top rated tax relief service that offers experienced tax professionals who work with tax debt resolution and tax preparation services. Since 2010, Community Tax has helped over 50,000 clients resolve tax problems. Since 2010, Community Tax has offered a variety of tax services for consumers who are experiencing trouble with the IRS. Their tax professionals are experienced in assisting with a wide range of tax services including bookkeeping, tax debt resolution, and tax preparation. Community Tax strives to provide a solutions oriented tax resolution experience to every client, regardless of the size and scope of the customer's case. Community Tax's custom tailored approach to tax resolution is based around a common set of company values including innovation, transparency, and ongoing accountability. Some of Community Tax's CTR negotiators are licensed tax attorneys; additionally, they have IRS enrolled agents and CPAs on staff. Community Tax's resolution services are currently available in 48 states, while all other tax services are available nationwide (all 50 states). 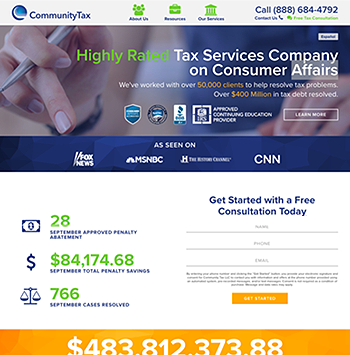 To learn more about Community Tax's services and pricing, you can contact them for a 100% free consultation. Experienced Tax Resolution Firm: Community Tax has worked with over 50,000 clients and resolved $400+ million in tax debts since 2010. A+ BBB Accredited Service: Community Tax holds memberships with the American Society of Tax Problem Solvers (ASTPS) and the National Association of Tax Professionals (NATP). Members of their staff belong to the American Bar Association (ABA) and the American Institute of Certified Public Accountants (AIPCA). Licensed tax practitioners on staff: Community Tax ensures that each of their clients have a licensed tax practitioner, a legal assistant, and a case manager to keep close communication and ensure your case is handled correctly. Bilingual representatives: Community Tax has both English and Spanish speaking staff to assist their clients. Additional resources: Community Tax offers extra resources, educational articles, and active and reputable social media accounts to help consumers with everything they need to know that is tax-related. Community Tax lacks specific pricing on their site for their services. However, Community Tax does perform a low cost flat fee tax investigation for prospective new clients, which demonstrates their commitment to transparency and delivering value. Community Tax does not turn away customers if they are unable to pay high upfront fees. Instead, they work with clients to set up a payment plan that fits their financial situation. There is no minimum tax debt amount for new resolution clients. As long as the customer needs help and Community Tax's fee is justifiable, Community Tax will assist with the case. Pricing depends on your unique situation, but on average, Community Tax charges clients around $2,500 to $4,500. Community Tax customers are charged a flat fee for investigative services performed before determining which program they choose. After the first investigation has been done, another flat fee is charged to cover the costs for representatives to complete the program. Community Tax offers a refund under specific circumstances. Clients usually have a 14-day grace period where they can receive a refund for upfront fees that have already been paid. Tax relief is a broad term that covers a variety of services created by the IRS and State taxing authorities, such as debt reduction, penalty abatement, and even interest reduction for businesses and individuals. Can I pursue tax relief on my own? Yes, but it can be much more challenging to pursue it on your own. Accredited tax relief services like Community Tax have knowledgeable and licensed agents who have years of training and education.